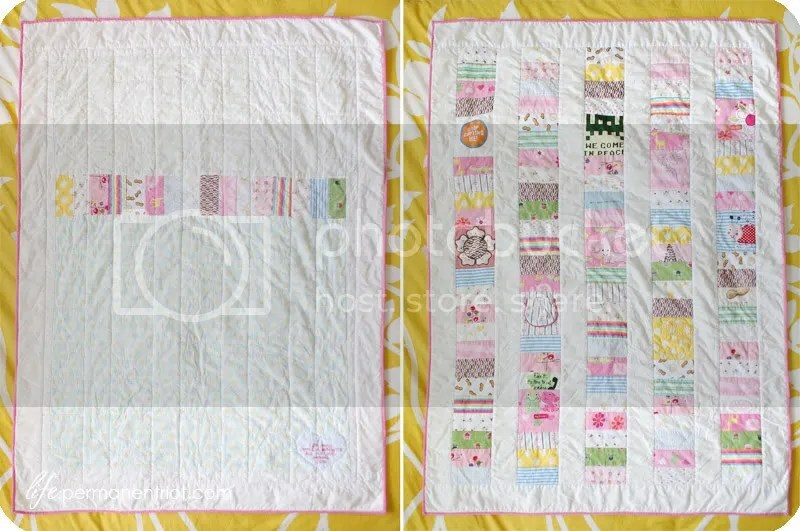 I was digging through my folder of crafty project photos today and realized I never blogged the finished quilt I made for Paul from his old baby clothes. This has been finished for quite a while (almost a year now) but I just never got around to posting it. 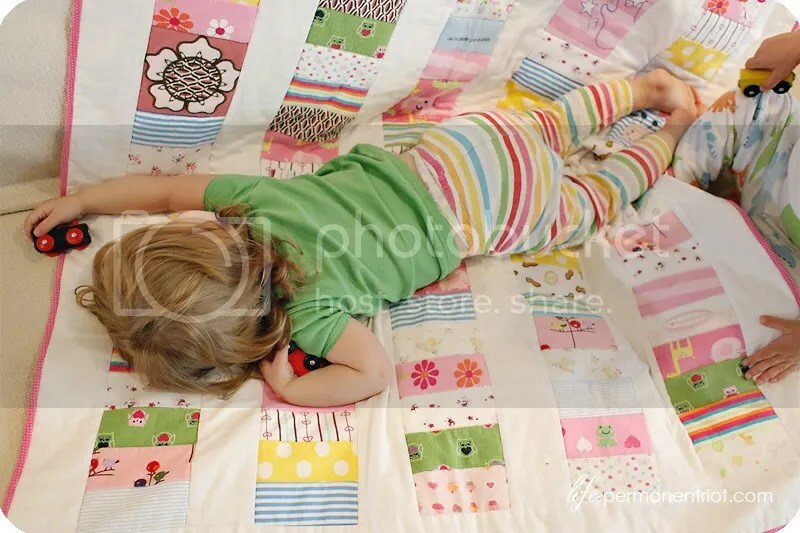 It’s essentially exactly the same as Amelia’s baby clothes quilt but made of Paul’s clothes (duh). 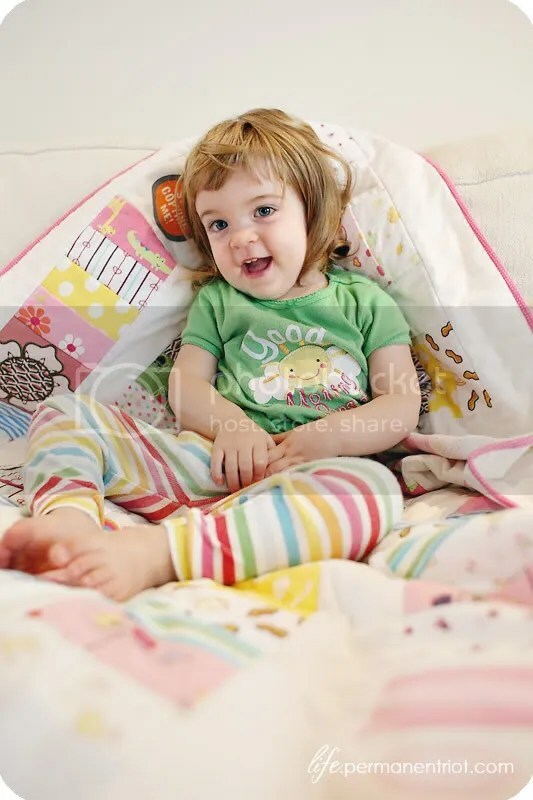 Both of their quilts are made from the clothes they wore during their first year… I can’t believe it’s already almost time to make Edie a quilt (yikes!) time is certainly flying! 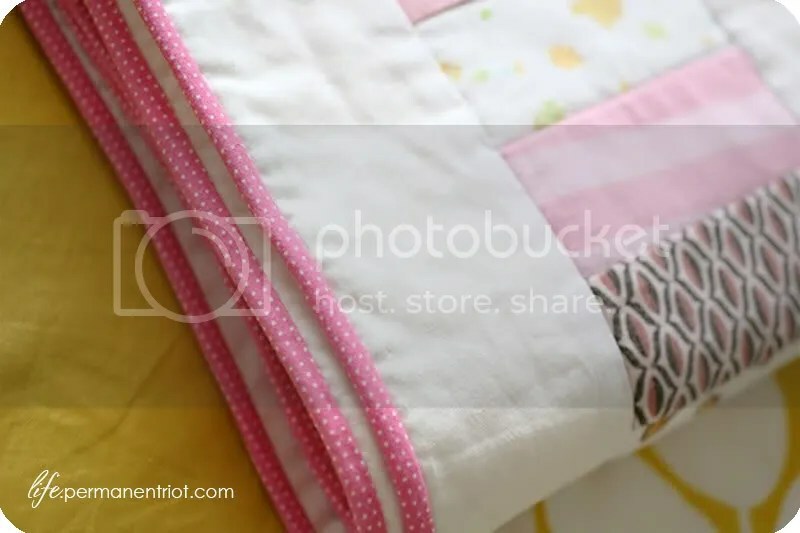 If you happened to miss Amelia’s quilt post and are wondering how to make one of your very own go and check it out – there are tons of links/explanations on how I made it and all of the tutorials I used. Hooray for baby clothes quilts! It’s finished! The quilt is finished! I actually finished it a while ago (last week?) but between the traveling and general chaos in my life right now I just haven’t had time to put together a proper blog post about it. Well that and I haven’t been able to get a decent picture of the darn thing and I didn’t want to blog it with bad pictures. But I *still* can’t get a good shot of it so I am giving up 🙂 Bad pictures it is. These are “fresh from the dryer” rumply quilt goodness – although I promise in person it doesn’t look quite so wompy, it actually looks quite nice. I just can’t figure out how to convey it in images. So you’re just going to have to take my word for it. The first of many “oh this won’t take *that* long” moments I had was in cutting up all of the pieces. I seriously underestimated how many outfits I would need (I think it was around 35?) and how many pieces I would have to cut total. I also decided early on that I would use interfacing on any of the knit pieces like onesies and jammies (which was all but about 3 outfits) so that it would be easier to sew with them and keep all the lines neat and even. I’m glad that I did it but MAN did that ever take a long time. I worked for days and all I had to show for it was a pile of rectangles. The piecing of the top actually went fairly quickly, the hardest part for me was deciding what order the rectangles should go in. I spent hours staring at it and shuffling them around until Ben finally told me I was over-thinking it (he was right). I was originally going to use a piece of cute quilting cotton I’d picked up at the fabric store for the back (with the little stripe that’s included in the tutorial of course) but it just didn’t look *quite* right so I decided to go with a couple of receiving blankets instead. They weren’t quite wide enough to cover the entire back so I ended up using a border of the same white sashing that was on the front. I think it turned out quite nicely. 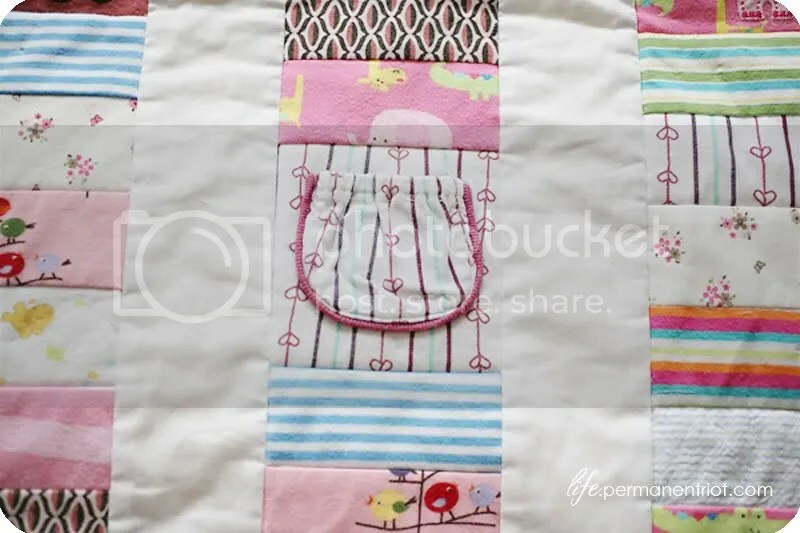 I saw a bunch of great tutorials on free motion quilting and quilting in fun patterns, but honestly I was a little worried about just completely ruining all of my hard work (and Amelia’s baby clothes) by sewing nonsense on top of it. So I opted for stitching the ditch instead. It seems like it would be pretty straightforward but I still wanted some tips. While super brief, I found this explanation pretty helpful, especially the part about stitching to one side of the seam… it worked out well (I think). I stitched down each of the long vertical seams and along every other horizontal ladder line in the center of the quilt and around all of the borders as well. 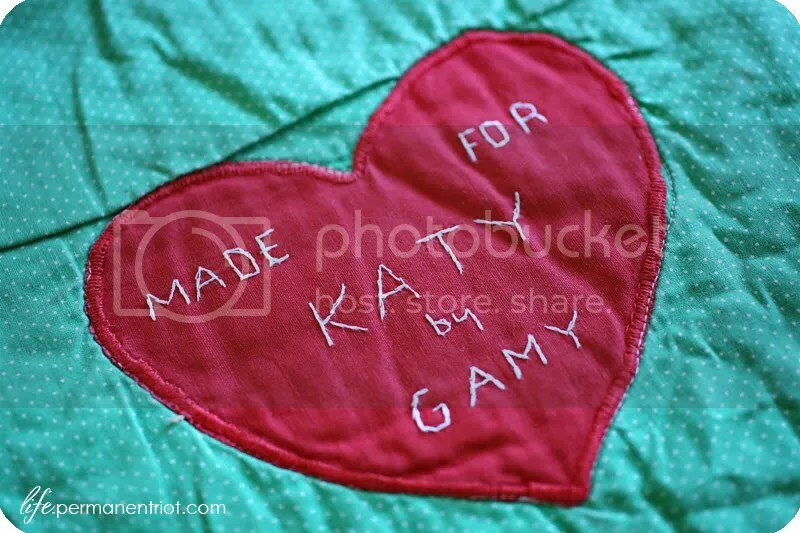 So the quilt was – well – quilted. Bound. Almost ready to go! The last step was a label. I knew I wanted to do something embroidered but I wasn’t sure how. While I do own an embroidery hoop (purchased for some never-attempted screen printing project years ago) I had never actually done any embroidery so I consulted the internet (yet again) to find out what the basic steps were. I ended up using this site to learn the chain stitch – which I’m pretty sure was never intended to write letters with but oh well. I didn’t know any better so I did. They didn’t turn out perfectly but I still like it. 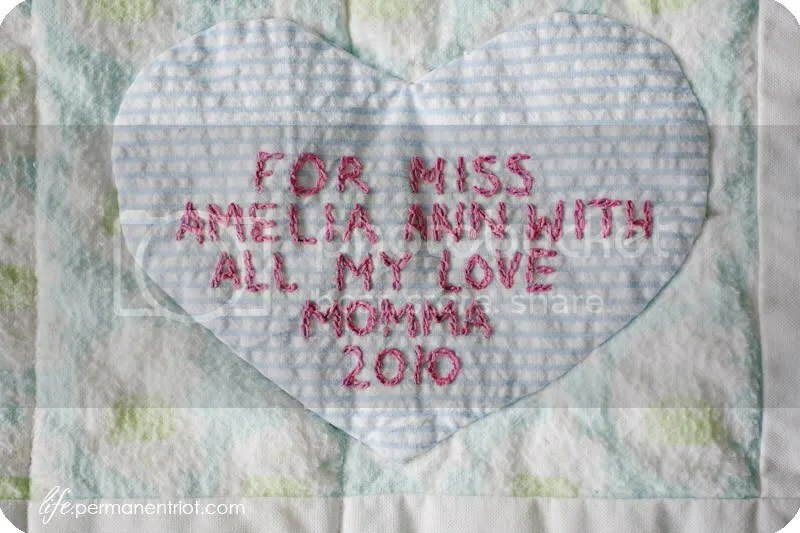 I’m pretty sure that the best part of the quilt (and anything I’ve ever made for Amelia to be honest) was watching her reaction when I gave it to her. She pretty much loves it to pieces. She squeals with delight and yells “night night!” when she sees it. She wants to take a nap on it and snuggle with it and generally love it (which was the idea so I couldn’t be happier). She also loves to sit on it and point out all of the little animals and birds. It’s pretty darn cute. Now I just need to make Paul’s 🙂 Oh. And in case you didn’t see the first two “in progress” posts on the quilt, they can be found here and here.